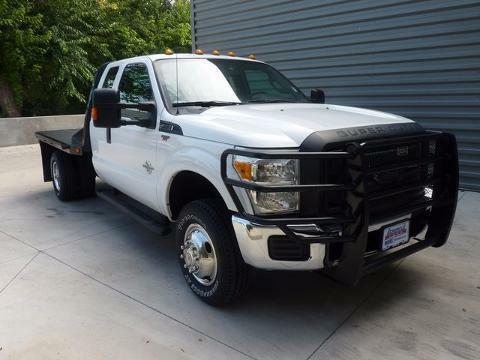 ONE OWNER xxxx FORD F 350 SUPER CAB 4X4 SUPER DUTY XL DRW WITH A NEW FLAT BED, BLACK RANCH HAND BUMPER, BLACK STEPS, CLOTH SEATS, TRAILER BRAKE, FACTORY UPFITTER SWITCHES, POWER WINDOWS, POWER LOCKS, CRUISE, SYNC. CALL OR STOP BY FOR A TEST DRIVE!!! ---- IF WE DON'T SERVE YOU, WE DON'T DESERVE YOU! Seminole Ford proudly serving the following communities Seminole, Shawnee, Prague, Tecumseh, Wewoka, Holdenville, Wetumka, Ada, Norman, Stroud, Okemah & Meeker.